Laurel Anderson specializes in plant physiological ecology, which is the study of how plant physiology interacts with species distributions, community patterns, ecosystem cycles, and global environmental changes. 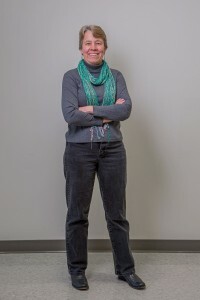 She has published research on topics such as plant responses to past and predicted future changes in atmospheric carbon dioxide and is the Coordinator of the Ecological Research as Education Network (EREN), a program that supports the development of collaborative, multi-site ecological research projects involving faculty and students at undergraduate institutions. Her current research involves the physiological and community ecology of garlic mustard, an invasive plant recognized as one of the 10 worst in Ohio. Anderson, L. J. and Cipollini, D. 2013. "Gas exchange, growth, and defense responses of invasive Alliaria petiolata (Brassicaceae) and native Geum vernum (Rosaceae) to elevated atmospheric CO2 and warm spring temperatures." American Journal of Botany 100: 1-11. Bowne, D. R., Downing, A. L., Hoopes, M. F., LoGiudice, K., Thomas, C. L., Anderson, L. J., Gartner, T., Hornbach, D. J., Kuers, K., Machado, J. L., Pohlad, F. B., Shea, K. L.. 2011. "Transforming ecological science at primarily undergraduate institutions through collaborative networks." BioScience 61: 386-392. Anderson, L. J., Derner, J. D., Polley, H. W., Gordon, W. S., Eissenstat, D. M., and Jackson, R. B. 2010. "Root responses along a subambient to elevated CO2 gradient in a C3–C4 grassland." Global Change Biology 16: 454-468. Gill, R. A., Anderson, L. J., Polley, H. W., Johnson, H. B., and Jackson, R. B. 2006. "Potential nitrogen constraints on carbon sequestration in a grassland exposed to subambient and elevated atmospheric CO2." Ecology 87: 41-52.